The U.S. version of the European Alfa 75 medium-premium model (pictured) was called Milano. TURIN, Italy - Alfa Romeo's next two cars will be called the Milano and Giulia. Surprisingly, the news did not come from Alfa or its parent Fiat Group. Instead, Chrysler, Fiat's new alliance partner, revealed the names in its submission to the U.S. Treasury for government bailout money. Chrysler included two Alfa cars that it could build in the U.S. when it unveiled its latest restructuring plan for long-term viability on February 17. The first Alfa model will be called Milano. The Milano will replace the 147 entry-premium car. It is due in Europe in spring 2010 and code-named project 940. Milano is the Italian name for Milan, the city where Alfa was established in 1910. 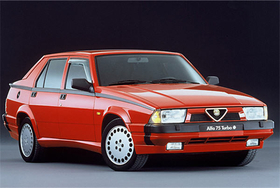 The name was used in the 1980s for the U.S. version of the European Alfa 75 medium-premium model. Alfa used the name Giulia for a range of successful sedans and coupes (pictured). The second model will be called Giulia. It is due in Europe in late 2011 and is code-named project 953. The Giulia will replace the 159 medium-premium sedan and station wagon models. Giulia is Italian for the women's first name Julie. 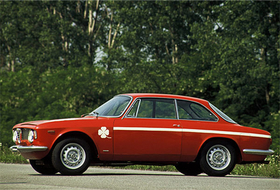 Alfa used the name for a range of successful sedans and coupes produced in the 1960s. In January, Fiat said it planned to take a 35 percent stake in Chrysler. Fiat will pay no cash for the stake but will provide Chrysler with platforms and low-emission engines. Fiat could eventually pay between $25 million and $200 million to raise the stake to 55 percent. Fiat will use its partnership with Chrysler to gain access to Chrysler's production and dealer network for Fiat and Alfa cars.